Chanteuse US née Valerie June Carter, le 23 Juin 1929 à Maces Springs (Virginie). June Carter a débuté avec sa mère et ses soeurs Anita et Helen Carter, dans les Carter Sisters. June a épousé Carl Smith et en deuxième noce Johnny Cash. Elle a eu deux filles, Rebecca (Carlene Carter), fille de Carl, qui a enregistré un premier disque en 1978, et Rosanne, fille de Johnny, qui s'est aussi mise à la Country Music depuis le milieu des années quatre vingt. June Carter est décédée le 15 Mai 2003. Songwriter, singer, actress, comedienne, and matriarch of country music June Carter Cash was born Valerie June Carter in Maces Springs, VA, on June 23, 1929. Taught by her mother (the legendary Mother Maybelle Carter of the Carter Family) to play autoharp, June entered the spotlight in 1937 singing with her sisters Helen and Anita, eventually performing as the Carter Sisters after the death of June's uncle A.P. Her good humor and quick wit prompted June to perform comedy skits and monologues during the show, and led to a novelty recording of "Baby, It's Cold Outside" with country comics Homer & Jethro which eventually hit number nine on the country charts in 1949. 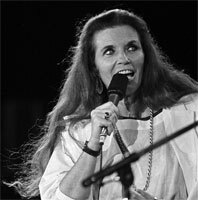 In 1952, Carter married Carl Smith, with whom she performed at Nashville's Grand Ole Opry, and their daughter, Rebecca Carlene (later to record under the name Carlene Carter), was born in 1955. After their divorce in the late '50s, Carter was managed by Colonel Tom Parker and toured with Elvis Presley, and while living in Nashville, she met and briefly married local police officer Rip Nix with whom she another daughter, Rosie. 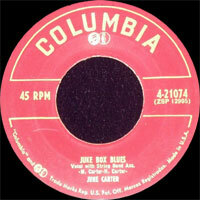 Although Carter dabbled in acting during the '50s, she returned to the musical stage in 1961 when the Carters joined Johnny Cash's road show. Rumor has it that Cash had kept an eye on June since her appearances with the Carter Sisters in the early '50s, commenting, "I'm going to marry that girl someday" (despite the fact that both of them were still married to other people at the time). In 1963, Carter co-wrote the song "Ring of Fire" with Merle Kilgore, which Cash (supposedly June's inspiration for the song) took to number one. Their Grammy-winning duo "Jackson" came true when Cash and Carter "got married in a fever hotter than a pepper sprout" in 1968. Cash has long credited June for forcing him to shake his addiction to amphetamines and encouraging his spiritual development, saying, "she is the person responsible for me still being alive. She came along at a time in my life when I was going to self-destruct." 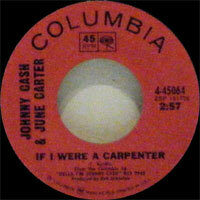 Another Grammy (for "If I Were a Carpenter") and the birth of Carter's third child, son John Carter Cash, followed in 1970. 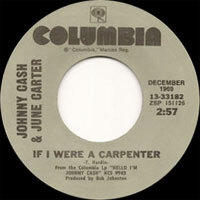 June Carter Cash left the spotlight for most of the '70s and '80s, stating, "I worked with John, but I had enough sense to walk just a little ways behind him. I could have made more records, but I wanted to have a marriage." She did, however, write two autobiographies (1979's Among My Klediments and 1987's From My Heart) and also did some acting, notably on Dr. Quinn, Medicine Woman and alongside Robert Duvall in The Apostle. She did eventually return to recording, releasing a collection of both traditional folk songs and Carter Cash originals entitled Press On in 1999 which won a Grammy for best traditional folk album. Johnny Cash's health seemed to deteriorate throughout the '90s just as his career went through a renaissance, and many fans were shocked when June Carter Cash died suddenly on May 15, 2003, following complications from heart surgery. Given the fact that she had remained apparently rock solid as he got weaker and weaker, it seemed as though Johnny might pass on, but Carter Cash would live forever. Luckily, she does live on today; through the children she raised (many of whom have become musicians themselves), through her writing and appearances on film, through the contributions she made to her husband's life, and most clearly in the music she left behind. 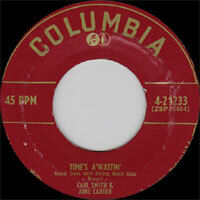 01/1950 78 t. RCA VICTOR 21-0169 (US) HOMER & JETHRO & June CARTER - I Said My Nightshirt (And Put On My Pray'rs) / (Put Another Nickel In) Music! Music! Music! 01/1950 SP RCA VICTOR 48-0181 (US) HOMER & JETHRO & June CARTER - I Said My Nightshirt (And Put On My Pray'rs) / (Put Another Nickel In) Music! Music! Music!